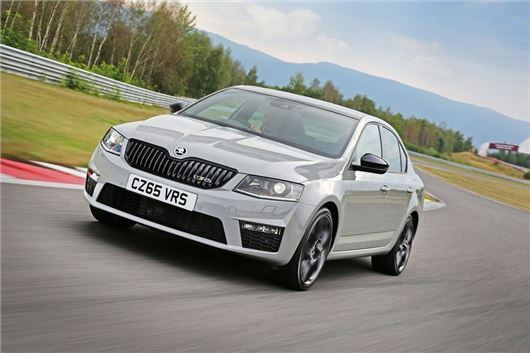 Skoda has bolstered the specification of the Octavia vRS diesel with optional four-wheel drive and navigation as standard. The Octavia vRS 4x4 is available to order now, with prices starting from £27,315. Diesel-powered Skoda models have been in the news in recent weeks as part of the Volkswagen emissions scandal, with Skoda admitting that around 1.2 million of its cars are fitted with an emissions cheat device. However, unlike the older Octavia that uses the EU5 EA189 2.0 TDI engine, the latest vRS diesel uses the EU6 compliant EA288 engine, which means it passes all the tests. Prices for the front-wheel drive Octavia vRS TDI start from £24,230 for the hatchback and £25,430 for the estate - an increase of £400 for both models - however, the inclusions of navigation - which was previously £755 - will give some customers an outright saving of £355. Four-wheel drive models will command a premium of £1450 and combine the vRS 184PS four-cylinder diesel with a six-speed DSG automatic gearbox. There's no manual option, but the addition of all-wheel drive lowers 0-62mph performance from 8.1 seconds to 7.6. However, fuel economy also drops from 64.2mpg to 57.7mpg for the hatchback, while estate models will return 56.5mpg - 4mpg less than the standard model.